The evening was pleasant and the perfect temperature, with overcast sky. 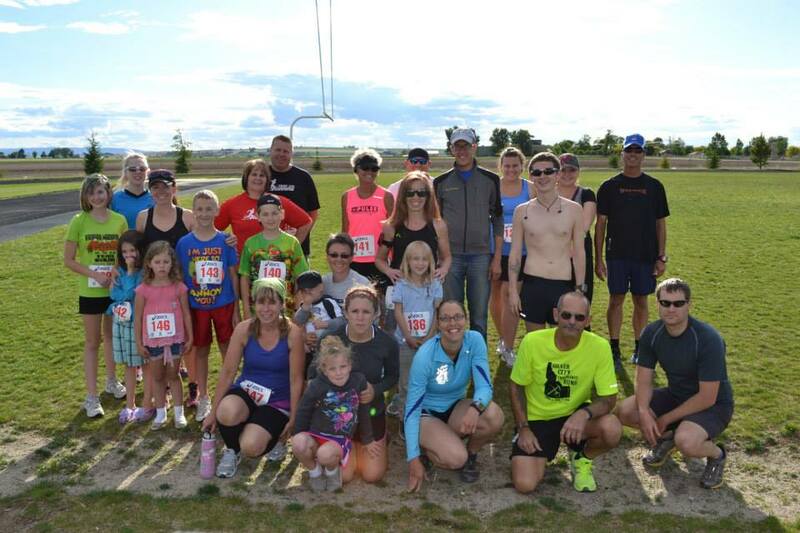 Nineteen adults and fifteen kids took to the oval for the sixth annual Nampa, Idaho TVR run, and it was fun as usual. Shirtless Shorty Shorts Sean Olson cranked up the pace early and held on for the men’s win for the second year in a row, with The Ryans following closely. Christie Ebenroth captured the women’s title, with Julie Tinney and Francie Hill shortly behind. Francie ran her own version of the race earlier in the morning by herself, making her result even more impressive. The post-race celebration included an assortment of sodas with ‘cherry’ in the name, along with chocolate milk. All runners received schwag cleaned out of the Pickled Feet Ultra Running and Final Kick Events directors’ garages. Looking forward to next year already! The evening was pleasant and the perfect temperature, thankfully clearing after a day of ominous grey skies. 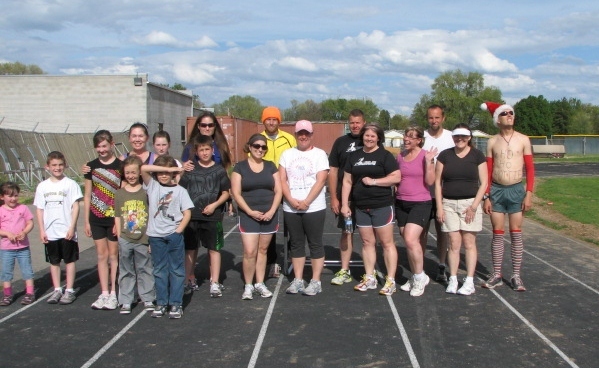 Eighteen adults and seven kids took to the oval for the fifth annual Nampa, Idaho TVR run, and it was fun as usual. Perennial favorite Ben Blessing made an appearance with dog Shadow but declined to run citing some silly 100 miler in Bryce the following weekend. To take over the shirtless division from Ben was up and coming youngster Sean Olson who cranked up the pace early and held on for the men’s win. Close behind was Christine Kollar, last year’s winner and women’s record holder. Several additions made this year’s event pretty much top shelf: I brought race numbers, which, as you know, always takes things up a notch. Jon Kinzer with Tortise and Hare Timing brought out his system to test out in a lap format race. We required that everyone keep their own lap counts, just in case, which was a good thing because there were a few glitches. Still, everyone got to wear chips…which was pretty rad. Wayne Ebenroth, Final Kick Events director, brought his camera, cleaned out a bunch of schwag from his garage, and helped with organizing things. And last but not least, remembering a few people’s dire bathroom issues from last year, we moved the location to a track that featured an adjacent portapotty. The post-race celebration included an assortment of sodas with ‘cherry’ in the name, along with chocolate milk. All runners received ‘race packets’ along with strong encouragement to leave with a variety of water bottles and other so-called ‘schwag’ cleaned out of the Pickled Feet Ultra Running and Final Kick Events directors’ garages. Awards were a sweet and eclectic assortment ranging from old race t-shirts to a bag of charcoal briquettes to a 30-pack of hot dogs to other left over race schwag, which people got to pick from as their names and times were called, first to last. Looking forward to next year already! The evening was pleasantly cool and slightly overcast, so we didn’t get our heat training like we did last year. 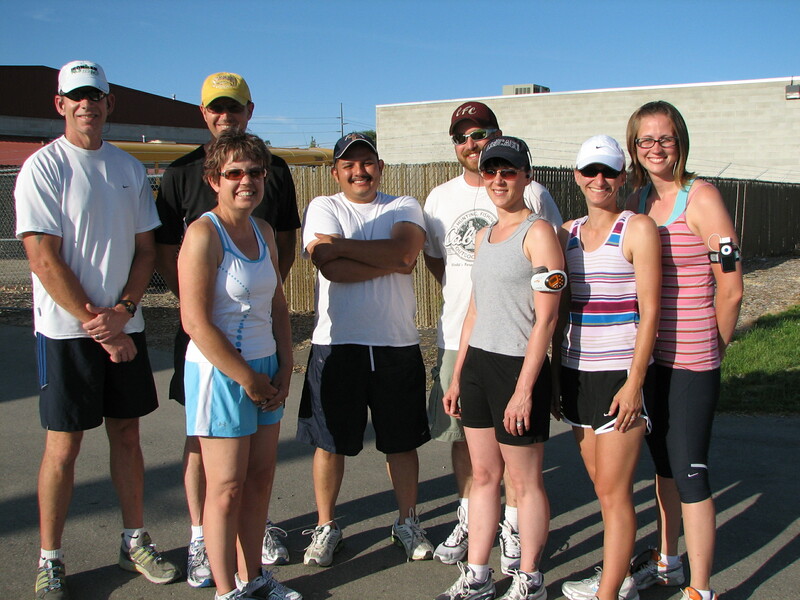 Twelve adults and four kids took to the oval for the fourth annual Nampa, Idaho TVR run, and it was fun as usual. Ben Blessing showed up ready to break his local record; however a mid-race departure up to the convenience store to use the bathroom prohibited him from taking the lead. He did set a bathroom run record, though, surely. Newcomer Freddy Hernandez took an early lead and held on, ultimately stopping three minutes early. With some coaxing, though, he went out for one more lap to tie the existing local record of 14800 meters. 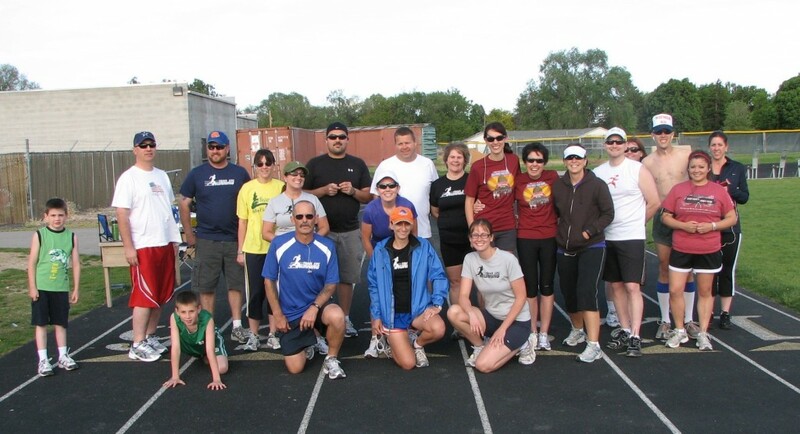 All others had a good time, setting a more go as you please pace, with the exception of Christine Kollar and Tim Birch who put in solid runs wearing oh-so-cute matching shirts. Honorable mention goes to Tanner Jackson and Dieter Berriochoa (both age 9) for running the whole hour, accumulating 7200 meters (~4.5 miles) each to tie for our kids’ division record. Post-race celebrations were somewhat affected by the power outage at the local store, which prohibited me from providing the promised chocolate milk; and they were out of the regular black cherry soda; SO, cherry 7-Up won out, and it actually tasted pretty darn good after a run. Weather: sunny and clear, breezy, around 80 degrees. Attendance: 21 participants and at least 10 spectators. 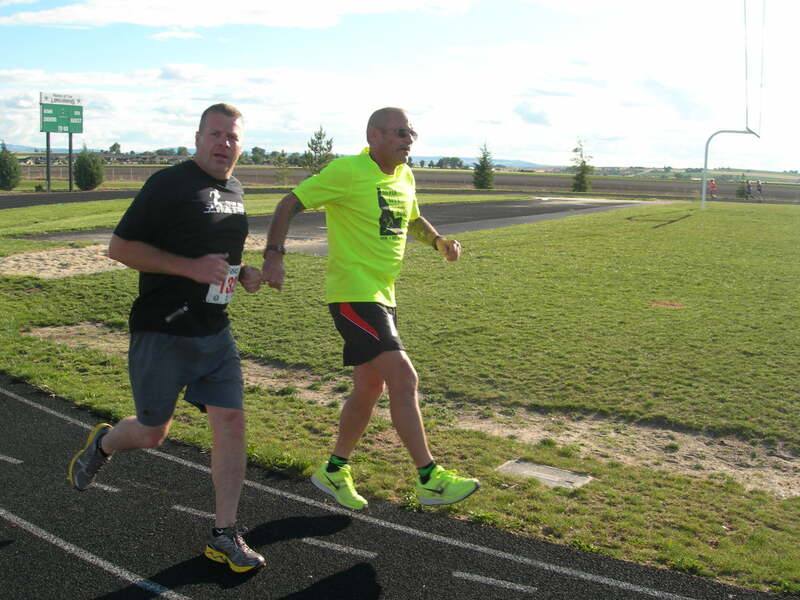 The third annual Nampa edition of the Titus Van Rijn one hour track classic is in the books. People gave performances that are truly inspiring, living out their stories of weight loss, starting over, or continuing journeys. We had an especially strong kids division, inspiring vision and hope for the future. Although Ben Blessing did not surpass Andy Jones-Wilkins mark as was his goal, he did take the Nampa TVR crown for the second year running, in his usual stylish manner. On the women’s side, Christie Ebenroth took the crown, bettering her mark from last year in a super run. We upped the ante in the post-race festivities arena by hauling out the BBQ and grilling hot dogs to add to the celebratory black cherry soda. 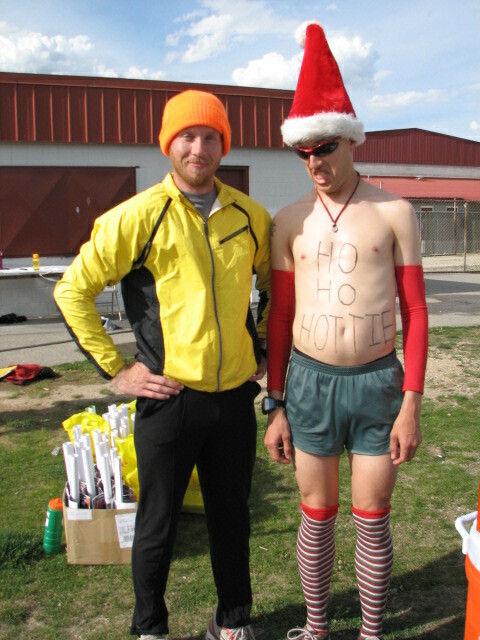 Prizes for all participants were donated by our local Shu’s Idaho Running Company. Temperature: 50’s and overcast; beautiful night for running. Our Nampa edition of the Titus Van Rijn was an undisputable success. We were up to 21 runners this year from 9 runners last year. Many runners from Team CFC showed up, but the lure of the oval was clearly overwhelming, as we were blessed by many of our non-Team CFC friends and their friends. The presence of UltraBen “Trail Thrasher” Blessing was most entertaining and amazing. Following the race, we celebrated with a bunch of schwag from Shu’s Idaho Running Company and some of our own runners, and we enjoyed chocolate milk and Hansen’s black cherry cream soda. Good time! Special thanks to some of our track-side support: Pastor Monty Sears, Heidi Peck, Scott Bowman, Mercedes Concepcion, and Wayne Ebenroth. And all our kids, of course. Temperature: The high for May 28 was 91 degrees; although it had probably cooled a bit from that by 7:00 pm, it was still a hot one. I would have to call this competition an indisputable success. The first Nampa running of the Titus Van Rijn One-Hour Distance Classic is in the books. What an epic night! It was one of the hottest days of the spring, and even at 7:00 pm, sweat was flowing. Luckily, it had cooled a few degrees from the 91 F it had been a few hours before the run. The theme of this year’s TVR running was inspiration. Seven out of the nine runners have started running within the last year. Each person has fantastic running goals, and I am thrilled to witness the progress all of these people are making toward their fitness aspirations. I was blessed that they all came out to join me in a run, and I am planning more free events to get us all together and keep us inspired. Notably, Juan just started running within the last week and ran at TVR the farthest he’s run since high school! He’s running to lose weight, but is looking to make running part of his plan to keep the weight off permanently, and his wife has started joining him too. Juan showed up to the track in old running shoes without socks; I didn’t hear if he got blisters or not, but at least he didn’t wear the tall striped tube socks he had been considering. Juan’s goals for this TRV Distance Classic: to not pass out, to not have a heart attack, and to get some running tips. Good plan, Juan. His longest run before the TVR was one mile, but after Thursday’s 3.5 miles, he said he felt great. Mark my words: at next year’s run, he’ll be charging full-speed around that track, thinking an hour’s too short! Pastor Monty Sears and Ron Smith, although they insist they weren’t sandbagging, should have won TVR bragging rights by outsprinting me at the end, but it does seem that competitiveness was in remission for the evening. 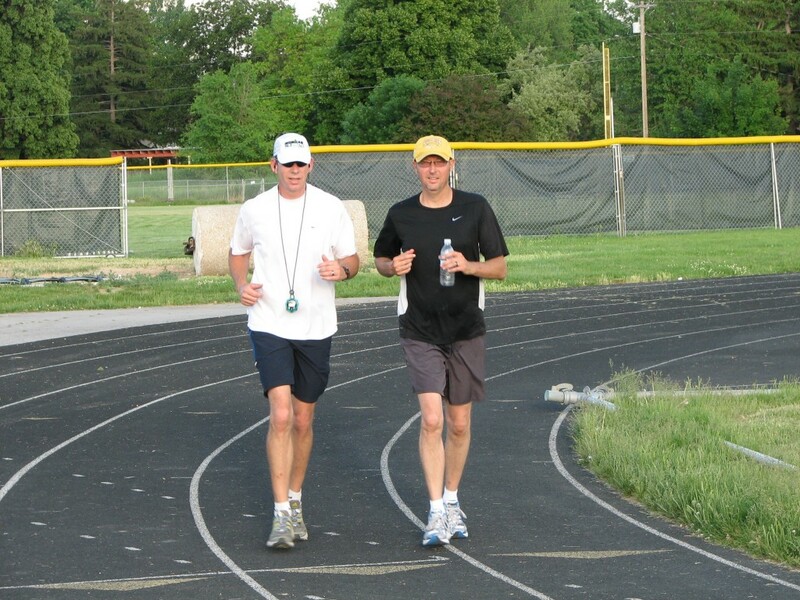 Their strategy to get through the hour was to do some light interval training in preparation for the 10k race they are gearing up for on June 20: 1.5 mile warm up at 10 min/mile pace, alternating 1 lap at 7 min/mile pace and 1 lap at 10 min/mile pace, and 1.5 mile cool down at 10 min/mile pace. Ron, just getting back into running since taking over a month off after a tough half-marathon in April, hopes to average a sub-8 min/mile pace for the Cherry Festival 10k, presumably hoping to beat Pastor Monty. Pastor Monty, although battling several injuries over the past few months, was looking strong and should give Ron a run for his money in the 10k. 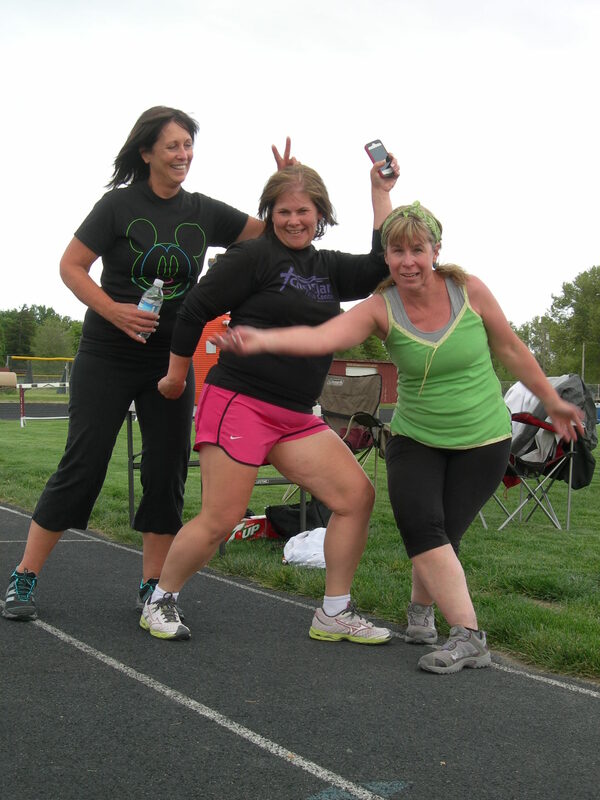 In any event, the evening’s real contest seemed to lie in the minds of the runners. Each person waged a personal competition, whether it was to complete a certain number of laps like Pastor Konrad, or to move in relentless forward motion like Juan, or to endure the heat like Kelli. Kelli Sears, who had been a racewalker but joined the running ranks this last January, remarked after the run that it had been harder than she anticipated, partially due to the heat, partially to her forgetting her iPod, and I suspect partially due to running in ovals for an hour; but she overcame and had an amazing run. My husband observed that he never once saw Kelli walking, a notable accomplishment due to the heat and length of the run. Kelli is also running her first 10k on June 20, competing in a hard-core throw down with her daughter over bragging rights and dinner bought by the loser. Brandy Ashley, who started seriously running in January after sporadically running for 9 years, commenced on a killer strategy of mostly running with a little walking, amassing an impressive 5.7 miles. Her goal was 6 miles, but she was a little slowed by some walking, which was necessary to keep down the dinner eaten shortly before the race. But that girl can really walk! Brandy’s running goal is to complete a half-marathon the middle of July, and I know she is going to exceed her own expectations. Davina Jackson called it an easy night, having run a tough 9-miler the day before, ending her run early at an even 4 miles. She started running a year ago April, finished her first half-marathon last October, ran a really tough half-marathon this April, and will finish her first marathon this coming October. She has also challenged a bunch of people to compete along with her in the Cherry Festival 10k on June 20. She’s nothing if not motivated. Pastor Konrad Ziesing, having been on-call for a wedding, arrived approximately 15 minutes into the race, and thinking we got started on time, set his goal for 10 laps. However, when he was informed that we got started late, he pressed forward and blasted through an impressive 15 laps in about 45 minutes on the track. This is especially notable considering he has not officially succumbed to being a runner, and still claims to not enjoy running. Don’t worry – his appearance at the TVR is a not-so-subtle indication that he is coming around. As for myself, I gave the run my best effort, even though my time was slowed somewhat by excessive stops for water at the “aid station” we had set up at the outside edge of the track. I eventually developed a strategy of running with a plastic cup in my hand for a lap, drinking little sips instead of gulping an entire cupful while wasting time at the table. Next year, I will definitely come into the race with a goal. Most of us celebrated at the end with Henry Weinhard’s Black Cherry Cream Soda (and some Orange Cream for variety). Everyone is looking forward to future gatherings, and I especially look forward to when my dad can join the running circuit again. He crashed his bike two days after April’s half-marathon, an unfortunate event which postponed his plans to race in Boise’s Ironman 70.3 on June 13 and the Big Horn Trail Run 50 Mile on June 20. C’mon, Dad! You can do it! For next year, I will have people document their pre-race goals and provide special incentive for those who achieve them. To all my newer runners: congratulations in participating in what was, for some of you, your first organized event, and keep up the awesome work. I can’t wait to see you progress in the coming year! Special mention: Thanks to my husband John for bringing all the water and gear down to the track, for keeping an eye on the kids, and for serving as the official race photographer. Thanks also to Tanja, Ron Smith’s wife, for taking the pre-race portraits and serving as moral support, cheering everyone on and even running three laps with Kelli despite being in recovery from a respiratory ailment.